The Vermont Senate Wednesday took a final vote on a bill that would legalize the possession and cultivation of small amounts of marijuana, but not taxed and regulated sales. Gov. Phil Scott has said he will sign the bill into law. 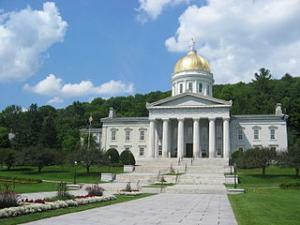 If and when he does, Vermont will become the first state to have legalized marijuana through the legislative process. Eight states and the District of Columbia have already legalized marijuana, but those were all through the initiative process. The bill, House Bill 511, legalizes the possession of up to an ounce of marijuana and the cultivation of two mature and four immature plants by persons 21 or over. It does not allow for legal commerce, instead "retaining criminal penalties for the possession, dispensing, or sale of larger amounts of marijuana." For now, anyway. The bill also calls for a task force appointed by the governor to study the issue and recommend "legislation on implementing and operating a comprehensive regulatory and revenue system for an adult marijuana market" by December 31. Vermont very nearly legalized it last year. The bill passed both houses of the legislature only to be vetoed by Gov. Scott, who said it needed small changes to win his approval. The Senate quickly approved the changes, but House Republicans blocked a needed vote on them during a short budget session last summer. The New Hampshire House approved a similar legalization on Tuesday. The actions in both New England states come just days after Attorney General Jeff Sessions rescinded Obama-era guidance to federal prosecutors deprioritizing federal pot law enforcement in states where it is legal. While the threat of federal intervention was not the driving force in the two states' moves to legalize personal possession and cultivation, but not a legal, taxed, and regulated marijuana market, the lack of legal commerce may provide some cover from federal prosecutors, who would be left looking for people with an ounce of weed or a couple of plants. They probably have bigger fish to fry.